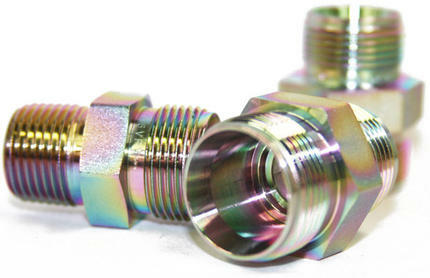 The Dursan® coating was developed to improve the hardness, corrosion resistance and inertness of stainless steel, glass and ceramic substrates. The Dursan coating is highly corrosion resistant, extending the life of stainless steel in harsh, corrosive environments. Comparative ASTM G31 hydrochloric immersion testing of Dursan coated and uncoated stainless steel coupons demonstrates Dursan exceptional corrosion resistance (200x improvement). That makes Dursan a low cost alternative instead of expensive super alloys. Dursan also improves the wear resistance of stainless steel by 2x, making Dursan an excellent coating choice for industrial applications and harsh environments. 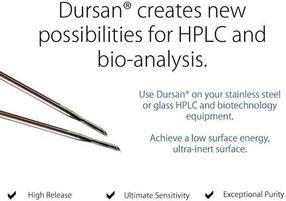 Coating components like capillary tubes, sample cylinders, fittings, valves and many more with Dursan, creates a very inert surface. 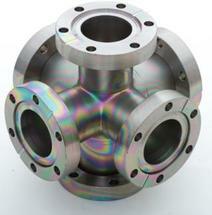 An interaction of active compounds such as H2S, NH3, SOx, NOx, with the surface is prevented. Dursan surface inertness allows analyzing low ppm concentrations with minimal loss between source and detector. The coating thickness is circa 500 Nanometer. The CVD process allows an all-over coating of even complex geometrical substrates.